In the Russian Buddhist Republic of Kalmykia. Over 300 musicians and children played Dombra at the ceremony to celebrate His Holiness the Dalai Lama’s 80th birthday. (TibetanReview.net, Jun18, 2015) – Thousands of people attended a musical extravaganza organized on Jun 14 in the Kalmyk Capital Elista in the Russian Federation with the participation of several republic government departments and numerous citizen groups to honour Tibet’s exiled spiritual leader, the Dalai Lama, for his 80th birthday. 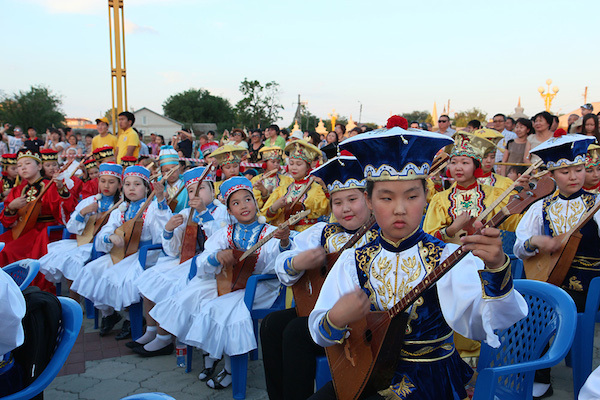 Some 330 young people, including children, played the traditional Kalmyk musical instrument called ‘dombra’ for the occasion which was especially held during the sacred Saga Dawa month of the Buddha’s birth, enlightenment and passing away. The event was staged as a part of worldwide celebrations to mark the Dalai Lama’s 80th birthday. The venue was the square in front of the “The Golden Abode of Buddha Shakyamuni”, which was built a decade ago and is considered the biggest Buddhist shrine in Russia and Europe. A large banner with a portrait of the Dalai Lama against the backdrop of the Potala Palace was displayed above the entrance to the temple. The event was initiated by Telo Tulku Rinpoche, the Honorary Representative of His Holiness the Dalai Lama in Russia, Mongolia and CIS countries, with the support of the Kalmyk government’s Ministry of Culture and Tourism, Ministry of Education and Science, the Elista Mayor’s Office, the Kalmyk National Orchestra, the Women’s Union of Kalmykia and other organizations, said the exile Tibetan administration at Dharamshala, India, on its Tibet.net website Jun 16. “His Holiness the Dalai Lama is the root guru of the Kalmyk people and to be able to present him with such a colorful musical offering is a big honour for each of us,” Telo Rinpoche was quoted as saying in his address to the gathering. Later in the beginning of July Kalmykia will host a concert by the Tibetan Institute of Performing Arts (TIPA) from Dharamshala. On Jul 6, when the Dalai Lama will turn 80, TIPA will perform in the Central House of Cinema in Moscow as part of programmes organized by the Moscow Office of Tibet and the Save Tibet Foundation.